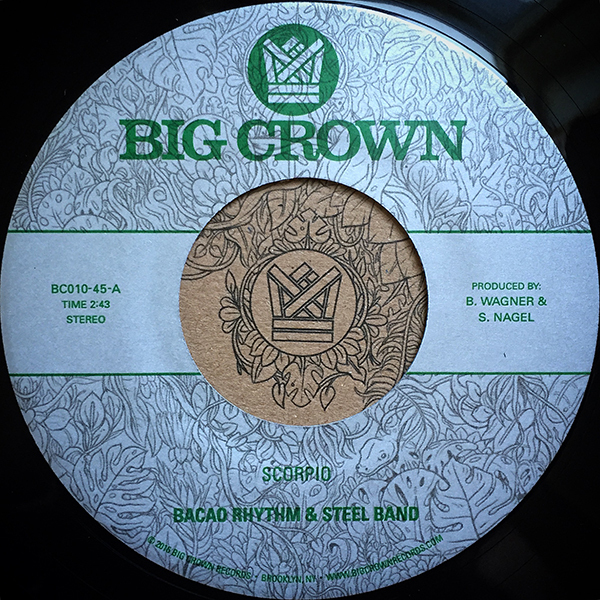 Big Crown Records is proud to present Bacao Rhythm & Steel Band’s new 45, “Scorpio” b/w “8th Wonder”. Coming after the smashing success of their debut full length “55” they drop 2 B-Boy classics back to back on this tough two sider that comes in a beautifully illustrated picture sleeve. The A side “Scorpio” is a killer cover of the Dennis Coffey breakbeat staple. BRSB turn up the tempo a touch on the original doing the tune justice with crushing drums they have become known for. This is sure to be in every breakbeat enthusiasts box. The B side features the non album cut, BRSB’s cover of The Sugarhill Gang’s “8th Wonder”, a tune that lends itself to pans like it was written for them. Another dance floor winner sure to be in DJs sets the world over shortly.